Rudman Winchell is delighted to announce that Stephen W. Wagner, Esq., has joined the law firm. Stephen will practice in the firm’s Municipal Law section. Stephen comes to Rudman Winchell from Concord, New Hampshire, where he spent two years practicing environmental and land use law. Prior to this, he clerked for the Maine Superior Court. 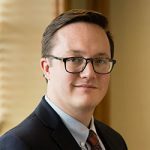 Stephen graduated from the College of the Atlantic with a degree in Human Ecology and earned his law degree at the University of Maine School of Law, where he served as articles editor of the Ocean & Coastal Law Journal. Stephen and his wife are happy to return to the area to raise their family. In his free time, he enjoys experimenting in the kitchen, tending the garden, hiking in the Maine woods, and spending time at the family camp in downeast Maine.